I have a LOT of catching up to do. . . I’ll start where we left off, and hopefully eventually find my way back to late summer of last year. I won’t be surprised if that never happens, but first things first; let’s get some crafts up! One of the simple things that T really gets a kick out of is making hand-prints. Lucky for her personal maid service (read: mom) she’s always been fairly good about leaving them on pieces of paper provided for just such a thing. I, of course, love it. How could you not? Baby paws are just the CUTEST thing that ever happened here in mommyland – who wouldn’t want to capture them?! And while some of T’s crafts get recycled after a while, or torn down and replaced, I find that I have a compulsion to forever hold onto anything involving one of those bitty little mitts! 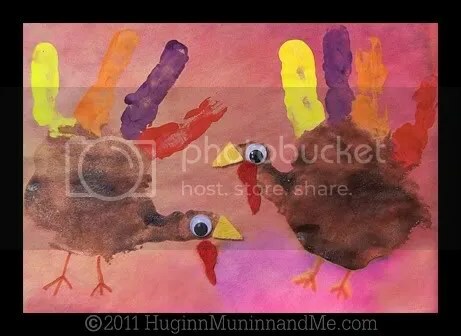 Soooooo, since it’s Thanksgiving time and turkeys are in season, we (obviously) made hand print turkeys! This simple (if messy) craft was a huge hit, and every last kid in the house made one. . . or six. This one was T’s favorite, because it involved actual painting. 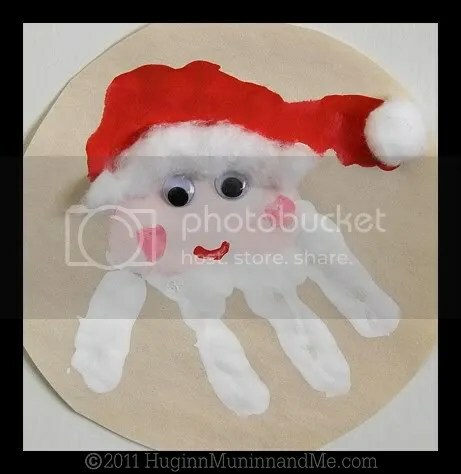 The other ones we made by painting little fingers and palms and smacking them down onto a piece of paper. Though messier, this version is my favorite because it’s an actual hand-print. I don’t have pictures to put up, but when I say that every kid in the house did this activity, I mean it. Every. Single. One. Even the tiniest little paws were accounted for – technically making this baby Ro’s first craft! 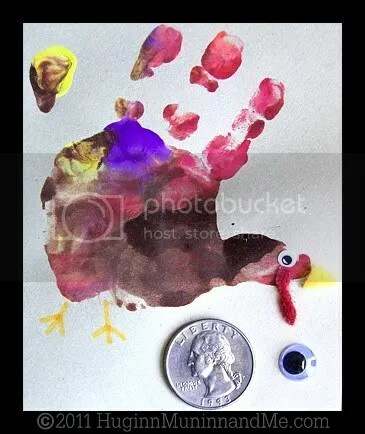 Shown with a quarter and a googly eye from one of T’s turkeys here (we used leftover stickers from T’s monster eggs), that’s pretty close to actual size on my screen. Awwwwwwww! T had so much fun with these that her hands have been covered in marker ink ever since (not that there’s really anything too unusual about that around here), and it’s no surprise to come upon her happily tracing fingers to make her own turkeys just for fun (I think I’ve finally convinced her to use a pen instead of literally covering her fingers in markers. If you have kids who have tried this with thick Crayola markers, then you know how MESSY they get!)! Naturally anything that inspires my Puffy also inspires me, so by the time Christmas arrived I had dug up a couple of new ideas for her to try out. . .
and we can’t forget her adorable little hand-Santas (I love the pink finger-print cheeks)! Come ON! Does it not just keep getting cuter??! 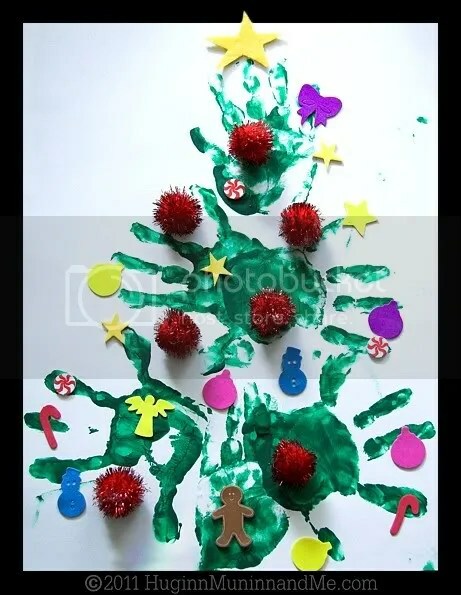 I hope you aren’t tired of hand-print crafts yet, because she also made a hand-print Christmas tree, which you can see she is VERY proud of! 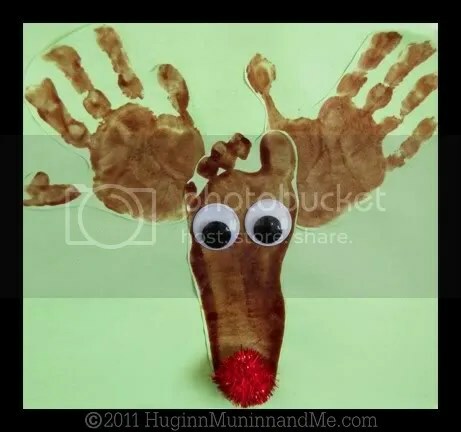 The best thing about all of these hand print kid crafts is that ANY kid can have a blast with them (C’mon! 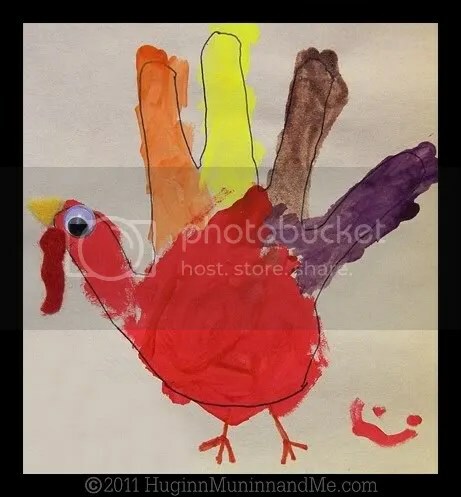 Even I have fun making hand print turkeys! 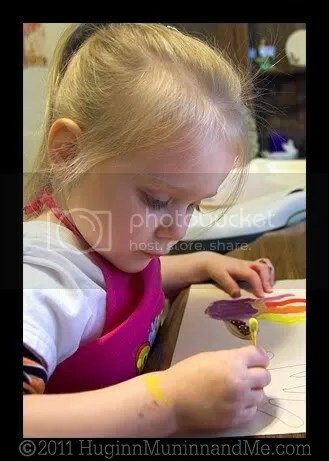 ), and the result is always something adorable and personal that they will be SO proud of – and no matter how many times you do them, they’ll always come out differently. (I showed my favorites of the many she did of each example. Once those paws are painted, there’s no stoppin’ Tea-ball!) Clean up might take a minute or two (we usually print and then wash up while the paint dries then come back to finish decorating), but once the paint is actually off the hands, these are fairly mess-free and they’re all fast – which is great when you need to squeeze things into little sister’s nap time (though she always wakes up earlier when we’re covered in paint and glue. I suspect she’s ready to join in the fun)! 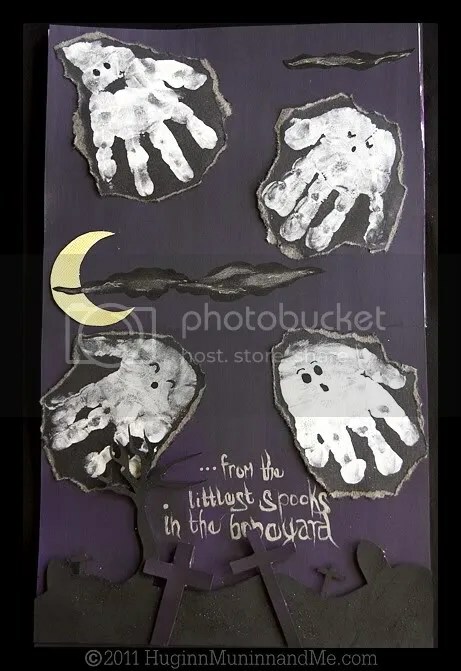 And while we’re on the subject of hand-prints, let me share the card that I made – with a bit of help from their twin daughters – for Munky Joe and Aunt Ange’s Halloween wedding anniversary. Please forgive the crappy lettering, and the random gravestone obscuring the words (it’s layered, so the ‘cemetery’ is raised above the background – IRL you can read it fine) it says “Happy Anniversary. . . from the littlest spooks in the boneyard” Obviously it’s meant to be from the little ones to their mom and dad. I love their tiny little hand-print ghosties! They came out SOOOO cute! T made a couple of these, too, but I can’t seem to find a picture to share! There! December, November, and even some October all in one post! Aren’t you proud! Keep an eye out for some more crafty bits coming up double-quick! I’m in love with handprints too!! I have them framed in many locations throughout the house and even in my bible. Feet too!! 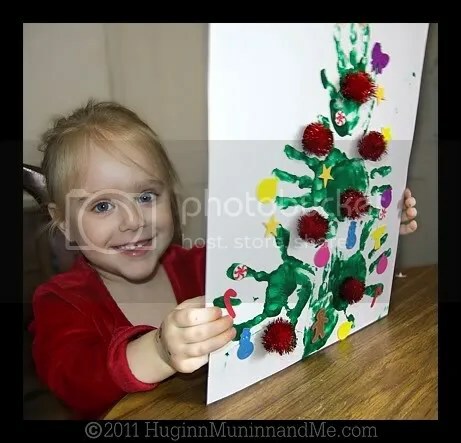 So those crafts you did with the littles were right up my alley! Hope you are enjoying the New Year and looking for crafts to try out! T and the tree is my current computer background at work! Aw, reindeers and turkeys. I’ve never seen anything like these ideas you get… very cool! The pic of T with her tree is a VERY lovely one of her.